In my first post on using 1D and 2D NMR methods to assign the peaks of quinine (Figure 1), I looked at the 1H spectrum. 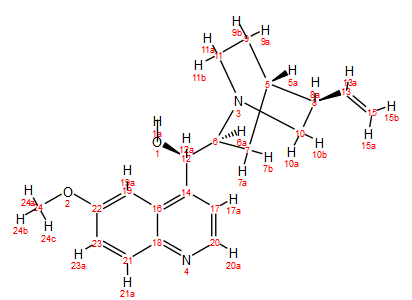 The Attached Proton Test (APT) is a very useful experiment that, like DEPT, provides information about how many hydrogens or protons are attached to a particular carbon atom. Both DEPT and APT do this by “editing” the spectrum so that the carbon signals point either up or down depending on the number of attached hydrogens. APT differs from DEPT in several significant ways, though. The first is that quaternary carbons (i.e. carbons that bear no hydrogens) are retained in the APT spectrum, whereas they are absent in DEPT (though there are variants of the traditional DEPT experiment that do retain the quaternary signals). In APT, quaternary and methylene carbons point down by convention, while methyl and methine carbons point up. Figure 1 shows a comparison of a conventional carbon, APT and DEPT-135 spectra of a sample of propyl benzoate. Fatty acids consist of long carbon chains ending with a carboxylic acid on one side and a methyl group on the other. Most naturally occurring fatty acids have an even number of carbon atoms and can be either saturated or unsaturated. Unsaturated fatty acids have one or more double bonds between carbon atoms. Typical fatty acids found in vegetable oils are saturated palmitic acid (C16:0) and stearic acid (C18:0), as well as oleic acid (C18:1) with a single double bond starting at carbon nine (omega-9), linoleic acid (C18:2) with two double bonds starting at position 6 (omega-6), and alpha-linolenic acid with three double bonds starting at position 3 (omega-3). 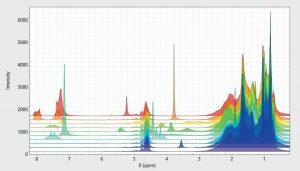 In my first two posts on using 1D and 2D NMR methods to assign the peaks of quinine (Figure 1), I looked at the 1H and 13C spectra. In this post, I’m moving on to look at the 1H-13C HSQC spectrum. It’s worth spending a brief moment recapping what HSQC is all about and what info it gives you. In a nutshell, the HSQC experiment correlates proton and carbon chemical shifts over one chemical bond. Another way to put this is that a cross-peak in an HSQC spectrum says, “The proton with this chemical shift is directly attached to the carbon with that chemical shift”. By convention, HSQC spectra are presented with 1H shifts along the horizontal axis and 13C shifts along the vertical axis. Some variants of HSQC also encode into the phases of the cross-peaks additional information about how many hydrogen atoms are attached to each carbon atom. This is sometimes referred to as multiplicity or DEPT editing. In the multiplicity-edited HSQC spectrum, it is conventional for the CH and CH3 groups to have positive phase, and the CH2 groups to have negative phase, just as in a DEPT-135 spectrum. Figure 2 shows the multiplicity-edited HSQC (“HSQC-ME”) spectrum of our 400 mM quinine sample. The CH2 signals are shown in blue and the CH and CH3 signals in red. The permitted hydrocarbon content of discharged water from offshore oil and gas exploration is becoming increasingly limited by more stringent legislation. This creates the demand for measurement methods that are sensitive enough to detect contaminants at ppm level, but also compact and robust to field conditions. 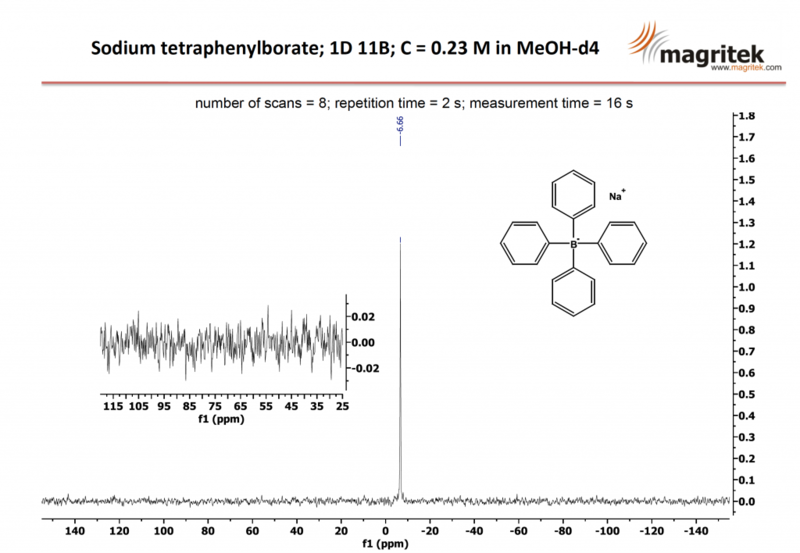 The group of Professor Mike Johns at the University of Western Australia in Perth has developed a benchtop NMR method to quantify the hydrocarbon content in water at the ppm level. Assigning peaks in the NMR spectrum is a fundamental part of structure verification. Depending on a variety of factors including the size and complexity of the molecule, and the field strength the NMR data are collected at, this can be a straightforward exercise or an extremely challenging one! 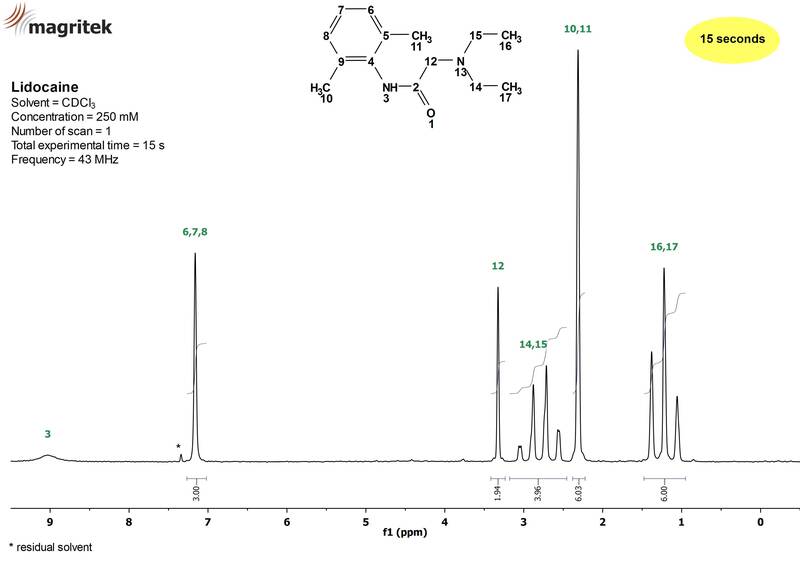 For example, in the case of a fairly simple compound like lidocaine, it is relatively easy to assign all of the peaks directly in the 1H spectrum using a 43 MHz benchtop NMR spectrometer. However, as a compound’s molecular weight increases so the spectra tend to become more complex, with more resonances and, inevitably, more signal overlap. Assigning the peaks thus becomes significantly more challenging, which is where collecting 2D NMR spectra can help with completing the assignments. Dr Catherine Santai is an Associate Professor of Chemistry & Biochemistry and Program Lead of the Integrative Sciences program at Harrisburg University of Science & Technology. 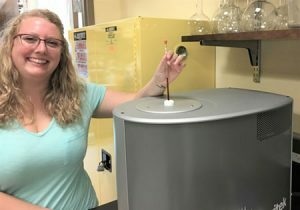 The program utilizes a number of analytical techniques teaching undergraduates about their use, giving them the experience ahead of entering research or industrial roles in later life. So far, the Magritek 60 MHz Spinsolve Benchtop NMR Spectrometer has been used in the Organic Chemistry and Biochemistry laboratory sessions. These provide invaluable hands-on lessons about NMR techniques and analysis of a variety of compounds. NMR is used alongside FTIR (Fourier transfer infrared), AAS (atomic absorption), UV-VIS (ultraviolet – visible) and fluorescence spectroscopies. At the Achema conference this week in Frankfurt we have a joint booth with Corning Advanced Flow Reactors. We are running a live Spinsolve Benchtop NMR reaction monitoring setup in combination with a Corning Advanced Flow Reactor. 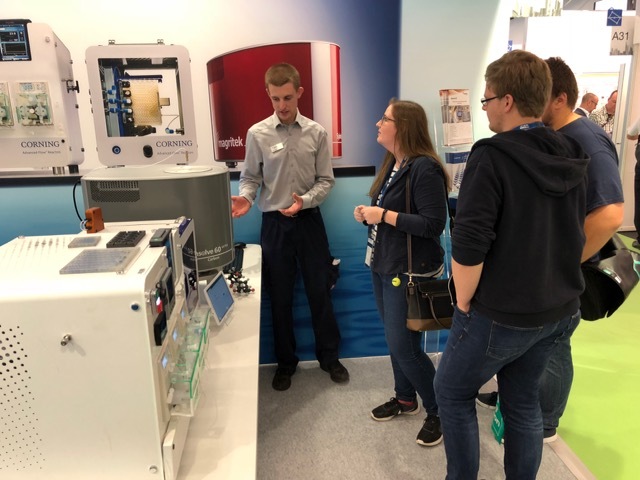 If you are Achema, please come and visit us at our joint booth with Corning AFR Hall 9.2 / Booth A32 and see the powerful combination of Corning Flow Reactors and Magritek Benchtop NMR. Due to their high retail value, some edible oils are often blended wilfully with other more inexpensive vegetable oils. Two recent publications by Kim et al. and Krause et al. 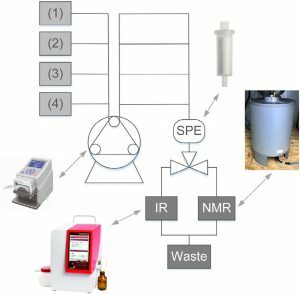 in international journals were able to demonstrate that Spinsolve 1H benchtop NMR spectroscopy is a possible cost-effective method for discriminating the authenticity of some vegetable oils. Overlaid 60 MHz 1H‑NMR spectra of genuine patchouli oils spiked with 9 different adulterants at 20%.